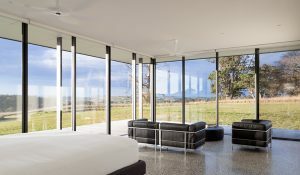 Southern Highlands House blends seamlessly with its outdoor setting; a transparent pavilion that hovers above the landscape, the internal and external spaces conceived as one. 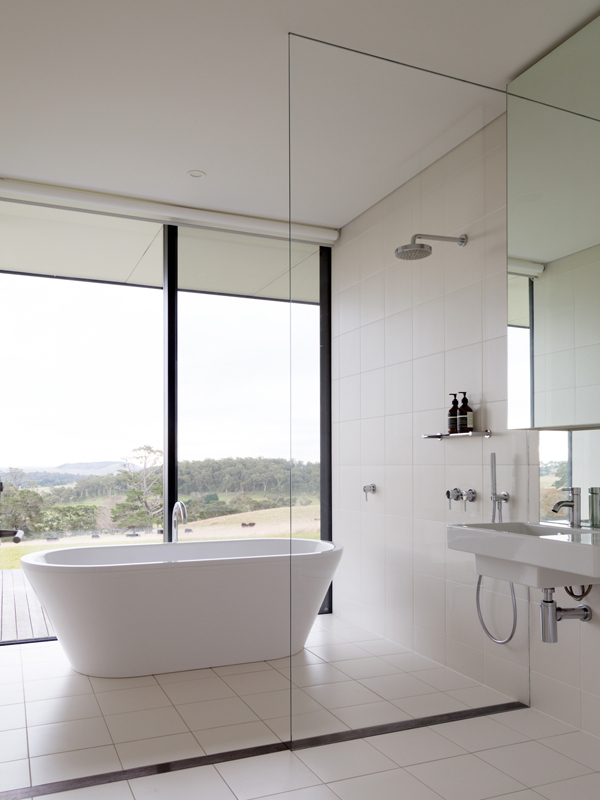 Intermode, in collaboration with Carr Design Group, has created the ultimate sense of retreat, tranquility and luxury. 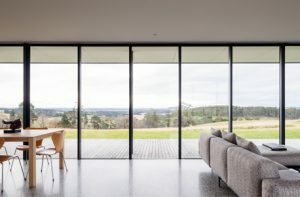 Positioned in Exeter, New South Wales, Intermode’s aim was to maximise the stunning views and outlook across the dramatic beauty of the Southern Highlands. The design does not only achieve this, but goes above and beyond. The transparent pavilion sits on a timber platform, sheltered by an overhanging flat planar roof form. 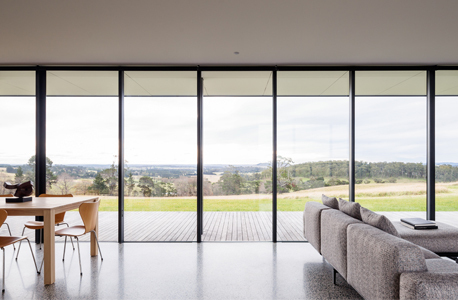 The building’s layout heightens the sense of separation from the city, and celebrates the escape to a rural setting through considered entry sequence. A gravel driveway winds through the site and arrives at a forecourt at the south of the house, suspending one’s entrance. 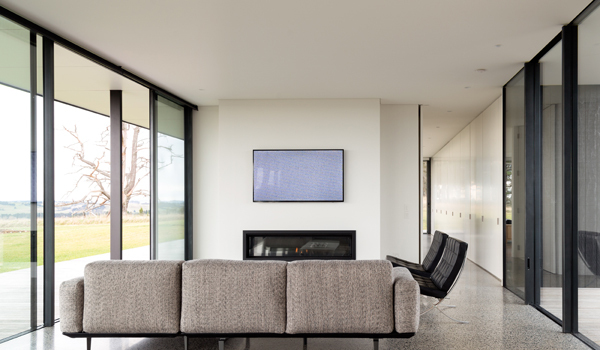 The southern facade of the house is predominantly solid, open only at the centre where glazing signals the home’s primary point of entry. 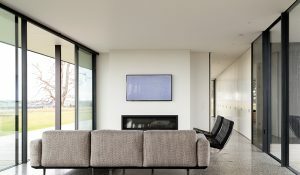 The framed landscape views are revealed only once visitors step inside, the solid wall becoming a threshold to the serene interior environment. The interior design cleverly maximises the transparency of the northern, eastern and western facades, allowing unlimited views of the world outside while maintaining privacy. A spacious outdoor deck extends the perceived living space, beautifully framing views of the building from a distance. The floor plan includes two distinct bedroom wings, each with an open living plan. The dining and kitchen areas have been situated at the pavilion’s centre, creating a comfortable, central hub for its occupants. 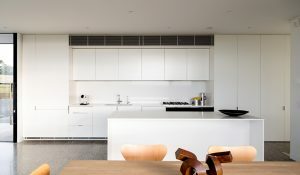 The material palette is minimal, refined and serene. 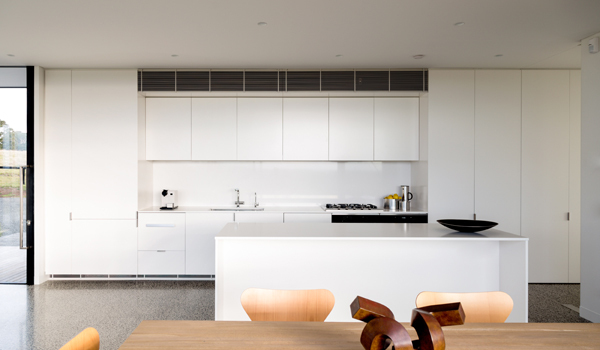 Think clean lines, stark white surfaces and smooth textures, allowing the view to do all talking. Intermode has maximised solar orientation, each room fitted with north facing glazing, and double-glazing applied throughout the house. 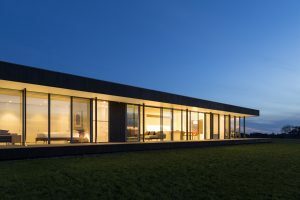 A deep roof overhang protects the glazing from direct sunlight in summer, but allows for maximum solar gain in winter. The entire building is externally clad in an engineered timber product, sourced from sustainably managed plantation forests. A rain garden filters and manages story water run-off on site. Intermode has made the dramatic beauty of the Southern Highlands even more dramatically beautiful.